Stacy Tilton Reviews: Take a break from weeknight cooking! Take a break from weeknight cooking! Some nights I just don't have time to make a big meal from scratch. And there are even some nights I have the time, but just don't feel like it after a long day. Lately that's been the case several nights because my allergies have really been getting me down. By the time dinner rolls around it's all I can do to make myself get up and go in the kitchen to prepare something for the kids and me. That's when I know it's time for me to take a break from cooking and give myself the rest I need. Thankfully there are other alternatives that I have as backups in my freezer. Otherwise it would result in going to fast food restaurants and I'm really trying to avoid them as much as possible. I keep things on hand like foods from Red's. They are super easy to pop in the microwave, or the oven and in no time have dinner ready. And fortunately they have such an extensive line-up of products there's something everyone in my house likes too. I like that everyone can have their own individual thing for dinner when they are home and ready to eat. Some nights my son doesn't want to come in and eat the same time as us girls so it's not a problem when I'm serving up Red's for dinner. He can come in and pop his food in the microwave when it's convenient for him. Of course sometimes I like to use our Red's products as our family dinner so I'll make up a batch of rice to go with the taquitos and enchiladas. That in itself is a fast and easy meal the whole family loves. What kind of ingredients does Red’s use? We like to keep it simple. It just tastes better. Our products are made with real ingredients—the good stuff you can actually pronounce. 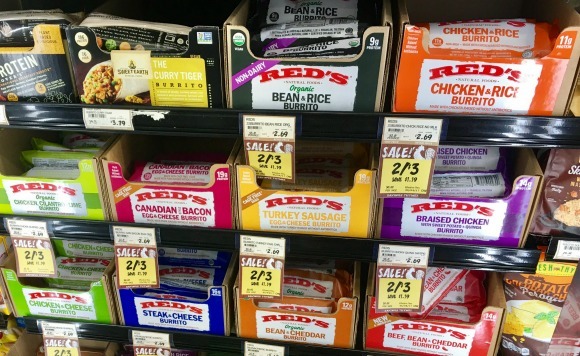 Red’s uses meat that is raised without the use of antibiotics or hormones and only the best grains, beans and vegetables. Period. The founder of Red’s Natural Foods, Mike Adair, decided to name his company after his beloved rescue dog, Red. Where can I buy Red’s products? Check out our store locator to find a retailer near you. 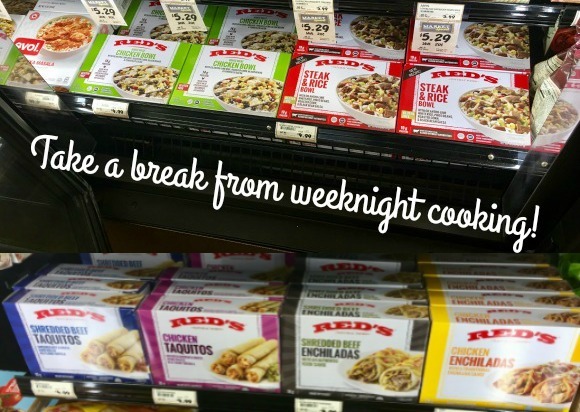 Look for Red’s in the natural and organic freezer section. Red’s currently offers Burritos, gluten-free Burrito Bowls, Enchiladas and Taquitos. They even offer organic and vegan options in their burrito lineup.